I swear not to buy another strawberry KitKat, but then here I am. I bought the bitter strawberry one, and now this one. In my defense, I was at work and wanted something small and sweet for a pick-me-up and the petit KitKats fit the bill. Also, this has hazelnuts, and I am a card carrying fan of Nutella and all things which mix filberts with any sort of chocolate. Yeah, that sounds like a pretty lame defense to me, too. 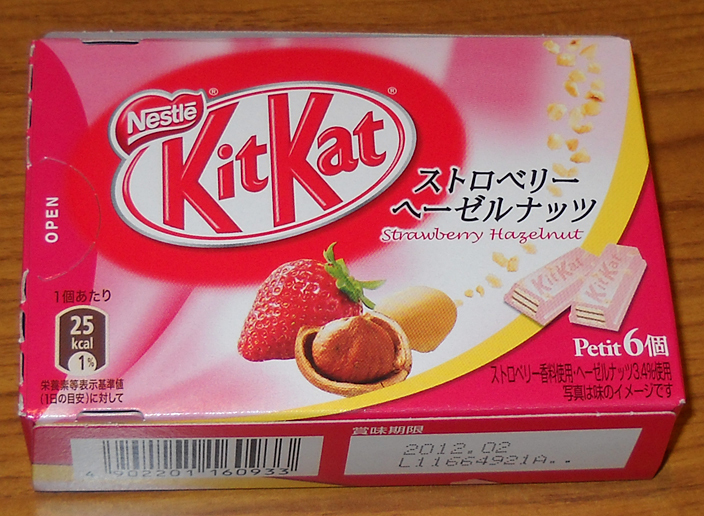 I admit it, it's hard to resist a new KitKat flavor, even a lame one. I found this at Family mart for 158 yen ($1.99). It's absurdly expensive for such as small portion. There are only 6 in the box and each is about the size of 1/3 of a single KitKat finger. Given the size, it's no surprise that each individually wrapped serving is only 25 calories. This compares favorably to similar consumer chocolates like Hershey'sKiss (which is also 25 per). There was also a "cookies and cream" variety on offer at the same time, but I passed on it for the time being as it was even more boring than this one. If it had been "cookies and hazelnut", you'd be getting two reviews instead of one. When I tried this at first, it was on the heels of sampling some jalepeno chicken thing my husband bought at KFC. No, I don't like KFC, but I took a few bites to try it (loved the spicy heat, hated the greasy chicken). Unfortunately, I think that affected my ability to detect the subtle flavor of the hazelnut. Spice-fried taste buds don't have good sensitivity. The second sampling revealed just the tiniest bit of hazelnut. It mainly served to cut through some of the cloying sweetness of the strawberry flavor. Other than the vaguest hint of hazelnut, this is your standard white-chocolate-based strawberry KitKat. It's too sweet, the strawberry isn't very realistic, though at least it's not "perfumey" as these things can sometimes be. I wouldn't buy this again, but I'm happy to finish the box because the sweetness can't build up to a strong level when you're eating so little at once. This isn't bad, but really isn't all that impressive either. I have never seen this one before. I have tried and enjoyed the strawberry KitKat but will have to add this to my new list of snacks to try. 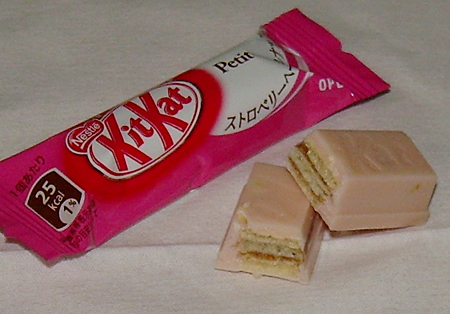 My favourite Japan KitKat to date has to be Sakura! !